An undercurrent of anxiety lies behind the newest pet products that busy working parents will instantly recognize. The tag registers the dog’s movements and sends the owner the data via a smartphone app. 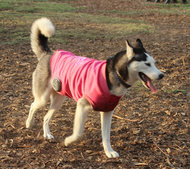 The Woofer, a dog vest with 30-watt speakers and an iPod pouch, provides music to accompany a jog in the park. Go-Go Dog Pals are cartoonlike animals that go 22 m.p.h. for dogs to chase. 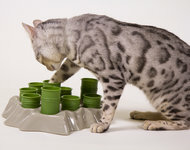 The Stimulo Cat feeder forces cats to use their paws to retrieve the food inside. The PASSport flap door can give 20 animals different times to enter and leave. What are the darlings doing all day while I’m at the office? Are they snacking too much? Getting enough exercise? Becoming surly and stupid from lack of intellectual stimulation? Could they be getting sick? Not to worry. There’s a wealth of innovative tools meant to ease the fears of even the most guilt-ridden pet owner. 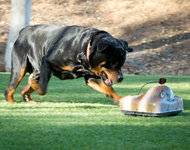 And since two-thirds of Americans share their homes with an animal, according to the American Pet Products Association, perhaps it shouldn’t be a surprise that pet care is going high tech, from tracking devices to a motorized, toy varmint that’s tough enough to withstand a big dog’s chomp. Take Whistle, one of a number of new pet-monitoring devices. A stainless steel tag embedded with an accelerometer registers your dog’s every move and feeds you the data via a smartphone app. The half-ounce device, which costs $100, clips to a dog’s collar and can tell an owner whether the dog has been asleep all afternoon or chasing its tail. Tracking a pet’s movements isn’t just about tracking its health, said Ben Jacobs, co-founder of Whistle. Sudden changes in behavior, like sleeplessness, can alert an owner that it is stressed or suffering from some other ailment before the symptoms are more obvious, he said. Similar products have been on the market for a couple of years now, but they’re adding features. For instance, Tagg — The Pet Tracker was initially meant to help owners find lost pets with global positioning technology when it was first sold in 2011. Since then, a tracking feature that charts a pet’s daily activity has been added. Like Whistle, it costs $100. Tracking capability is also being built into the newest pet doors. Electronic pet doors have been around for more than a decade, and sturdy, low-tech ones open and close like garage doors, activated by a pet wearing a battery-powered ultrasonic collar. But some newer flap doors have features that promise greater flexibility and the ability to collect data on the animal’s activity. Among the newest and most advanced on the market is the PASSport Pet Access Smart System, which PetSafe unveiled at this year’s Global Pet Expo and is just starting to sell. Ideal for anyone with a menagerie, the PASSport door can be programmed so that up to 20 animals can have unique time restrictions for going in and out of the house (as long as they weigh less than 50 pounds, since a larger door isn’t offered yet). Do 20 radio frequency identification keys seem excessive? Not to Bill Groh, director of the Pet Access Business Unit at PetSave, because during product development one pet owner testing the product requested nine keys for nine pets. Suggested retail price: $229 for a door that accommodates cats and small dogs and $279 for the medium door. O.K., but what if after all this fact-gathering it turns out your dog is lethargic as a slug? Then there’s an assortment of dog treadmills meant to keep off extra pounds. The first dog treadmills were used in the 1800s to churn butter and they have long been used by professionals and show dog owners. But lately, interest in home treadmills has taken off, said Krista Wickens, co-founder of PetZen, of Ogden, Utah. Ms. Wickens’s company sells three sizes, costing $500 to $1,000. Demand, she said, has doubled since her first model went on sale five years ago. Getting your pet off the couch is one thing, and calorie intake another. Two companies —AiKiou and Northmate — have redesigned chow time to give pets an intellectual challenge while making sure they don’t eat too fast. AiKiou (pronounced as I.Q.) sells food-delivery systems for dogs and cats (think: food bowl) that work with the animals’ natural problem-solving skills, said Alexandre Tremblay, co-founder of the family-owned company in a suburb of Montreal. The dog bowl, for example, is shaped like a paw and has sliding covers the dog must push around to get to the food. Then there’s the company’s Stimulo Cat Interactive Feeder, which has a series of tubes too small for a cat to put its face into. Instead, it must use its paws to fish out the morsels inside. The Green Interactive Feeder by Northmate sets out to accomplish the same things with an odd design. Instead of a container, the Green feeder is a patch of green fins that are meant to resemble blades of grass. The kibble goes between the blades, leaving the pet to nose it out. 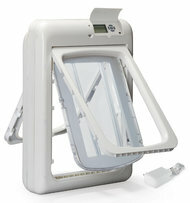 The company also recently introduced Catch, a bladed feeder sized for cats. The Green feeder is meant to imitate a hunt for food on the lawn, said Qinyin Zhou, a sales manager for the company. So for an after-dinner activity, what better than a game of chase? That’s the idea behind San Diego-based Go-Go Dog Pals. Convinced his dog needed more exercise, Will Bowen powered up an old remote control car in the park and his dog, Kota, went crazy for chasing it. “It’s a dog’s favorite thing to do, really,” he said. But toy racecars aren’t built for the roughhousing that the average dog brings to the equation. So Mr. Bowen’s inspiration was to “ruggedize” common, off-the-shelf racecar parts by encasing the chassis in a hard plastic covering. The first Go-Go Dog Pals varmint goes 22 miles an hour, and costs $230. It looks sort of like a cartoon woodchuck, and two new models — a skunk and a raccoon — are expected to be available soon. Finally, there’s the Woofer, a handmade dog vest with 30-watt speakers sewn into it and a pouch for an iPod, phone or MP3 player that sells for $100 to $120. According to its inventor, Matthew Baron, it encourages both you and your dog to get out and burn some calories while leaving the ear buds at home. At two and a half pounds, the setup is suitable for dogs 20 pounds and heavier. Adding a little music makes a walk more enjoyable for the owner and the pet, and the vets Mr. Baron has spoken with are supportive.